Anybody watching the Great British Bake Off last night was treated to an insight into the story of the humble ice cream cone and the penny licks. 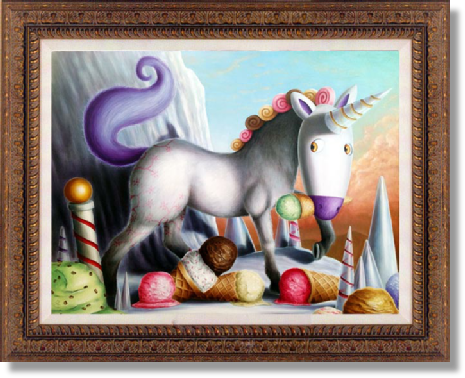 Its a fascinating tale that I researched for the 2012 release of the Crystal Tipped Unicone, part of the foodie themed Lost Impossimals that continues today of which I have included the story below. The Cantering Caketacular Queen Of Bakes from the 2013 Bloodlines collection found here also delves into cooking history with a brief outline of Victorian cookbookery shenanigans along with the Pompidoo’s French Fancy Filly a story naturally about French Fondants, click here to read. I’m still researching this cookery period for the next set of Lost Impossimals – Revelations in 2015 and its thrown up some surprising connections between food, science and indeed famous authors. In 1879, Charles, enjoying a little time at his London retreat and at the Victoria Empire Club one particularly hot day felt in need of refreshment. Outside of the club a street vendor was selling ‘penny licks’, basically ice cream served in special glass which you could lick the ice cream from. As Charles licked away he chatted to the vendor, a one Italo Marchiony, who was having a problem. His serving glasses had the particular problem of sometimes breaking, at other times being stolen and all too often being a little too unsanitary for most people. Charles thought about it a while and agreed, indeed it needed a solution. Returning to the club he buried himself in the library positive he would find something that would help Italo. In a dusty corner he found a battered book dating back to 1790, it detailed a journey through the Arctic Cordillera Mountains, one fraught with many a danger as the explorer searched for a creature called the Unicone. It detailed a trail that eventually led to a hidden mountain that was usually covered in snow and totally white but once every ten years that snow would melt for two weeks revealing that the mountain was in fact totally ice. The Unicones would then emerge from crystal carrying an assortment of coloured ice cream. It was this that intrigued Charles, what on earth did they carry them in? Maybe this was the solution for Italo. A year later Charles found himself at the beginning of a path through the mountains, using the battered book as a guide Charles eventually found the fabled mountain, which actually looked all rather ordinary, and made camp, he was a few days early so he patiently waited. He was not disappointed. At the beginning of the second day a fresh storm brewed up confining him to his tent for a few hours, as he emerged he was almost blinded by the light. The mountain in front of him had exploded in colour, acting like a giant prism the whole mountain shimmered and changed colour almost on a whim, thousands of coloured speckles only heightened the effect, on the highest peaks he could see many creatures dancing or even prancing around the edges, maybe these were the fabled Unicones? Using his specially adapted telescope he zoomed in on the closest, it was the most charming beast he had ever witnessed, a cross between a French Fancy Filly and a Four Legged Frump, it had a purple tail, dinky flowers around it’s back legs and across it’s neck eight smooth looking curls complimenting it’s intricate spiraled horn and it’s piercing eyes. As he watched they all danced together in rings, occasionally placing their crystal tipped horn into a sweet looking pool. As they pulled out the horn a quick flick of the head dislodged a cone shaped object. This object was then picked up in their mouths and used to scoop up the multitudes of ice cream that dotted the mountain and gave it that speckled colour look which from a distance looked like the whole mountain had been sprinkled with hundreds and thousands. Charles was awe struck, it was beautiful and he fell under its spell immediately unable to turn away for an instant. Charles remained watching the mountain for another eight hours until nightfall when the spell of the mountain relented and the Unicones returned to their caves for the night. In 1881 Charles was back in London and set to earnestly painting the Crystal Tipped Unicone, telling Italo, the ice cream vendor that he had found his solution but would say no more. In June of the same year the painting was complete, Charles led Italo into his studio and pulled away the sheet covering the painting. ‘Bello!’ Italo exclaimed then promptly fainted; he had never seen anything so beautiful. When he came too Charles explained the method the Unicone employed to Italo who beamed ear to ear as the penny dropped. It took many years of experimentation on the streets of London with some memorable disasters involving toffee and another using sugared bread until a breakthrough that allowed edible cups with flat bottoms and tapered sides to be produced. By this time though Italo had left London and moved to New York for greater opportunities. By 1896 Italo Marchiony had 40 push cart vendors selling ice cream in his edible containers; in 1903 he obtained a patent for a machine to manufacture the containers en mass. Its from this point onwards the history of the ice cream cone and indeed Italo’s becomes blurred. In 1904 the Worlds Fair in St Louis, Missouri hosted more than 50 ice cream vendors and more than a dozen waffle stands, everyone claimed they had invented the now popular ice cream cone. Fortunately with the discovery of the Crystal Tipped Unicone painting and Charles extensive notes we can finally declare Charles and Italo’s place in cone making history.